I watched your segment on the short track shootout (CLICK HERE) and I think the whole story is biased and not accurate with the statements I think there should be no winners or losers to pick snowmobiles in categories only reflects to the people ride them if they have yellow or blue underwear they will certainly lean that way! Everyone knows Arctic Cat was light years ahead of the competion when the 91 EXT hit the snow and the tall spindle front suspension again is years ahead of the rest and that's why Cat is building Yamaha snowmobiles! Cat is certainly the best built sled on the snow in every category and the last thing you want to do is pull on a Cat's tail! Thanks for your comments and glad to hear you're watching the show. We constantly get told we're biased to one manufacturer or another. 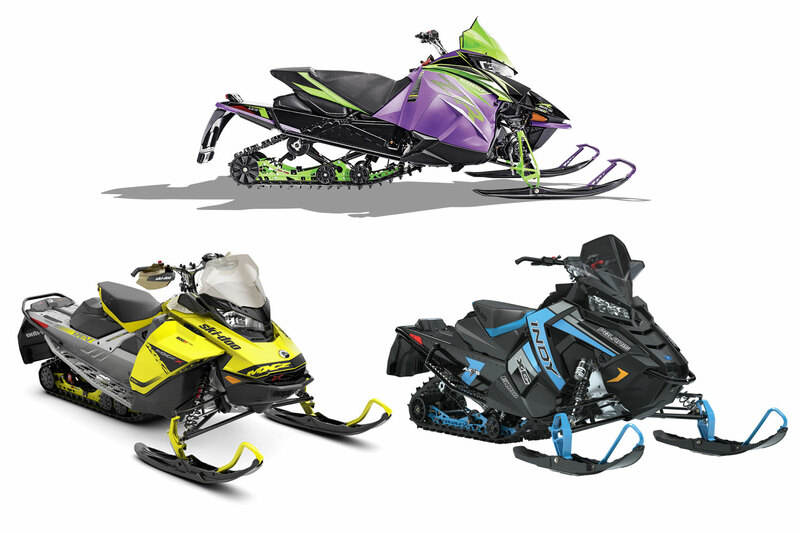 More often it's by Yamaha and Arctic Cat guys because we have more criticism for many of the sleds from these 2 brands. Before I go any further I'd like to just say that I understand where this frustration comes from, but it's simply the nature of what we do. We do not cater to loyalties and simply report the truth on the good and bad of what we test. Period. Our short track shootout was one that viewers had been asking about for a while. The results were not just the opinions of one or two of our crew. They were based on the opinions of our WHOLE crew who each ride thousands of miles every season and get a unique opportunity to ride competing sleds that they don't own back to back, day after day. Something few, if any, consumers get to do. This gives us a very interesting perspective because we have NO investment in the sleds we ride. I didn't spend my own money on any of them so I have no reason to want to praise or defend one over the other. Also, riding the sleds back to back...literally jumping off the running boards of one onto the running boards of the other on the same day, same trail, exactly the same conditions gives us the ability to identify what works and what doesn't from one sled to another. There is NO better way to determine which one rides the best, or which one has the best handling, ergonomics etc. Riding a buddy's sled from time to time doesn't cut it. So saying our story is biased only does one thing. It points out your own bias toward one of the sleds that did not win, in this case, the Arctic Cat ZR. You're not happy because it didn't do as well as the others so you accuse us of being biased. Why would we be biased? How does that benefit us. All 4 manufacturers advertise with us. It does us no good to unfairly praise or criticize one sled over another. We get no more or less money either way. You, on the other hand, want to be told that your sled, or the sled you like the most, IS the best. You have a desire to be right or to have your own opinion validated. That IS an example of bias. In terms of picking winners, we do this for one very good reason: our viewers overwhelmingly demand we pick winners. We have done "comparos" in the past and the majority of our viewers don't like the format. They WANT to know which one we think is best...they WANT a winner. In some instances there is a good reason to simply compare and not compete, but in a case where the 3 sleds were looking at are direct competitors with the same intended usage, similar features aimed at the same buyer, it is literally our JOB to find the best of the bunch. If you want to know what we think of each sled on its own, watch the test ride. The entire purpose of a shootout is to pick a winner. Your comment about Arctic Cat being lightyears ahead of the competition with the 91 EXT is irrelevant. It is not 1991 any more. Snowmobiles today are not judged based on sleds a brand built 28 years ago. Furthermore, the tall spindle design is a very good one - there is no question, but the true test of a design is how it actually performs. Not one of our crew would ever say Arctic Cat sleds handle badly. They certainly do not. In fact, for 2020 we fully expect Arctic Cats new front end to push its sleds near to the top of the list when it comes to front end ride and handling. However, as I said before, we get to ride all these sleds, back to back, day in and day out. In our well informed opinions, based on tens of thousands of miles of actual real world experience, Arctic Cat's original tall spindle front end did not ride or handle as well as some of its competition. Due to your obvious bias toward Arctic Cat I can see why you might not like or agree with our findings, but at the end of the day, our job is to report the truth as we see it, not simply cater to the loyal followers of one brand or another. The Arctic Cat/Yamaha relationship is based on a long list of factors. One of which is that Yamaha sees real value in Arctic Cat's platform, but don't for a second think that THIS is the only reason Yamahas are based on Arctic Cat chassis. There is WAY more to it than that. To your final point that Arctic Cat sleds are the best built sleds on the snow in every category, this is what gives away your bias the most. I don't blame a fan for having strong opinions toward his brand. I have strong opinions about GMC and Chevy trucks, Ducati motorcycles and SCOTT mountain bikes. They are fantastic products based on my own experiences. However, I wouldn't for a second try to argue against a professional test rider for any of these products that I know which one is best more than they do. In fact, I go to these sources for advice when it is time to buy a new toy... I read, watch and listen to their reviews and opinions and I base mine on what they say. Maybe I still let my own bias impact my decision making, but I'm not going to come out and say they're flat out wrong. They have way more experience with these products than I ever will.